Ah, Bordeaux! 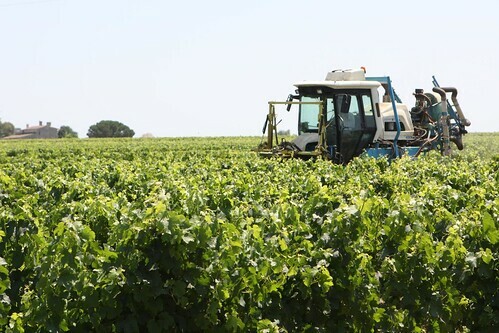 It's more than just a city, it's a whole region in France where they make some of the best wines in the world. Today's mission was to explore the area, taste some fine wines, and try to take a kickass picture of some sunflowers. 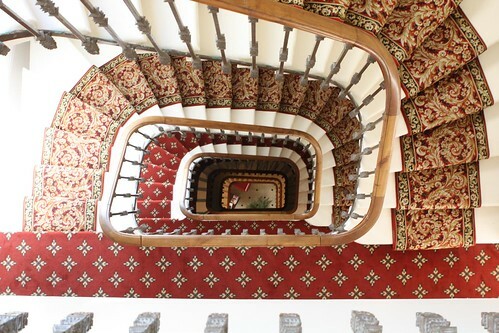 The walk down down the stairs to leave our hotel in the morning isn't so bad. It's the walk up at night that's a killer. The elevator can only fit about 1.5 full grown adults so we generally end up packing into it when we make our way back up to our rooms. The real kicker is that we're on the fifth floor. We're in Europe so the first floor is actually "Floor 0." They take this a step further by making the second floor "Floor E." I'm not sure what that's all about. All I know is that in America our floor would be called "Floor 7." It's reminiscent of that scene in Ghostbusters when they have to walk all the way up to the roof of the building. Only we don't generally have to choose the destructor at the end. I'm pretty sure the destructor would just end up being cardiac arrest anyway. 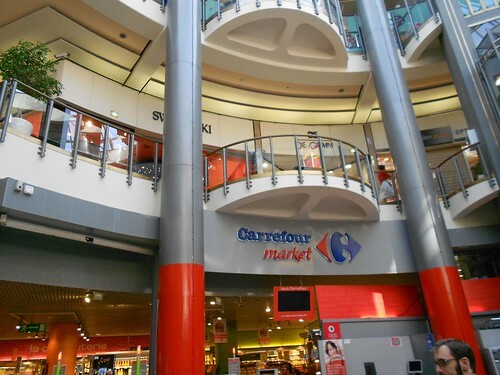 We stopped off at the supermarket in the mall nearby the hotel to pickup some treats before heading out on the road. We managed to get a good assortment of sweets, fruit, and drinks while a small woman almost ran us over with the floor-cleaning zamboni. 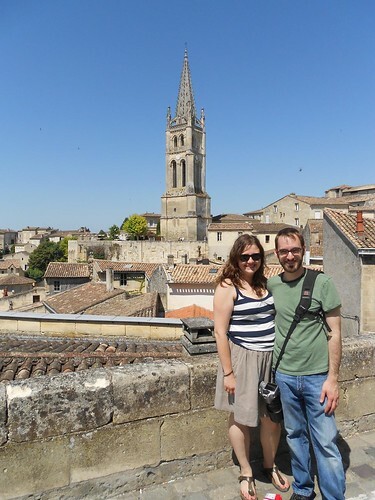 Later we headed out for Saint-Émilion in search of some vineyards and, what do you know, it turns out they had a lot! 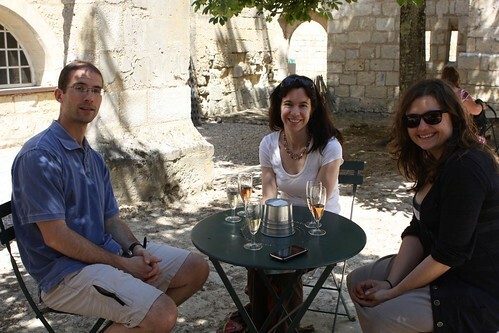 Our last stop in Saint-Émilion was to taste some sparking wines. We tried dry, soft, and sweet varieties of white and rose in cloisters from the fifteenth century. Total cost: $0.00. We pulled into what might have been some family's driveway then trampled all over their yard taking pictures of their vineyard like the worst kind of tourists. 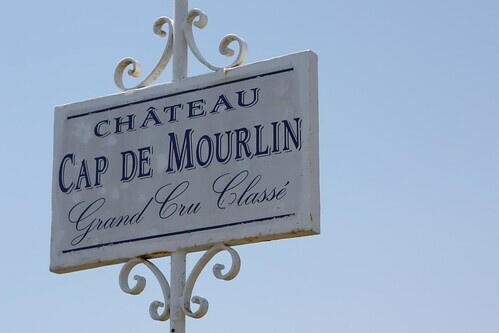 It was great that this vineyard was called Chateau Cap du Mourlin (or Merlin's cap). We stopped at another vineyard and I watched some sort of tractor working in the fields. This is the type of activity that would generally attract the attention of a two-year-old which is why I found it fascinating. The tractor kicked up all sorts of dust so by the time we were done buying our wines we had a nice thin layer of soil on the car. 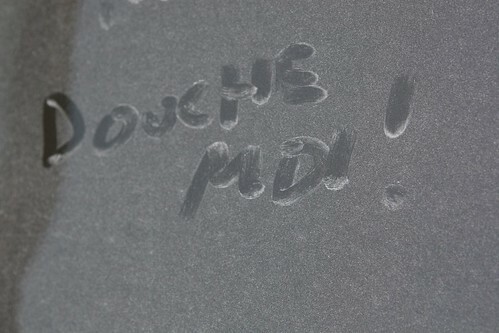 I took this opportunity to write an extremely poor translation of "wash me" on the car in French. This went far in embarrassing Jen as my French often does. After a day out in the vineyards we headed to a party on the outskirts of Bordeaux a mere twenty minutes away except for the horrific Bordeaux traffic which made it well over an hour. 1.) Taste fine wines: check. 3.) Not get run over by a supermarket zamboni driver: check. 4.) Watch a guy get out of a truck and brandish a tire iron at another driver that he was angry with: check. 5.) Get a picture of some badass sunflowers: still waiting.